Maybe the lip is on part of this slab that I failed to get in the shot. The installation of new lights on Albany’s riverside Dave Clark Trail has been completed, and I’m looking forward to a nighttime ride in brilliant illumination. But first, I was puzzled by this instruction on two of the newly poured slabs surrounding pedestals for the new lights. The City is always pulling crap like this and it is part of the reason construction is getting more expensive in Albany. Not to mention it is a waste of resources. Though the city looks at it as no big deal since it is other peoples money. Thanks for the update, sounds like a reasonable solution for both parties. Key wording there is “no expense to the city”. It’s been tagged like new construction. No doubt the contractor rolled its collective eyes at this “blue tape” tagging. As far as the rest of the city, potential hazards are everywhere but that would be a cost to fix. Since nobody wants a higher tax bill, it is what it is. Be thankful this isn’t Corvallis. Correct me if I’m wrong but aren’t individual property owners on the hook for fixing sidewalk hazards? Ah yes, but it’s always easier to hold someone else to a higher standard when they can be replaced at no cost to the city. But fix the downtown sidewalks using “our” money? No………….. Can’t be doing that. Maybe people should go around with cans of yellow spray paint marking the potentially disastrous sections of sidewalk. 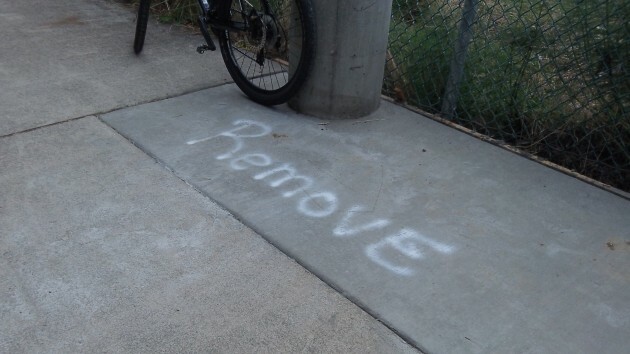 Not in a vandalism manner. Just to be safe ya know. As someone who uses the path on a regular basis, the real hazard are the six concrete post bases. Instead of putting them on the opposite side or moving the fence back they protrude into the multi use path and make a pinch point for users going in opposite directions. I can see two bicycle handles colliding. Sadly, it takes one of the best riverfront improvements with the lighting and makes the section look like a hack job.